A relatively recent phenomenon, the sending of commercially printed Christmas cards originated in London in 1843. Previously, people had exchanged handwritten festive greetings. First in person, then via post. John Calcott Horsley, a respected illustrator of the day, was commissioned by Sir Henry Cole, a wealthy British businessman. Cole wanted a card he could proudly send to friends and professional acquaintances to wish them a "merry Christmas". Sir Henry Cole was a prominent innovator in the 1800's. He modernised the British postal system, managed construction of the Albert Hall, arranged for the Great Exhibition in 1851, and oversaw the inauguration of the Victoria and Albert museum. Most of all, Cole sought to "beautify life", and in his spare time he ran an art shop on Bond Street, specialising in decorative objects for the home. 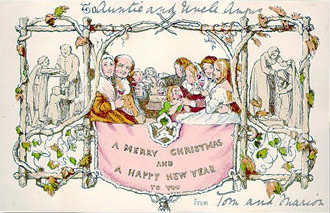 In the summer of 1843 he commissioned Horsley to design an impressive card for that year's Christmas. Horsley produced a triptych. Each of the two side panels depicted a good deed - clothing the naked and feeding the hungry. The centrepiece featured a party of adults and children, with plentiful food and drink (there was severe criticism from the British Temperance Movement). So the design proved controversial but the idea was shrewd as Cole had helped to introduce the Penny Post three years earlier. This first Christmas card's inscription read: "merry Christmas and a happy new year to you". Merry was then a spiritual word meaning "blessed" as in "merry old England". Of the original one thousand cards produced for Henry Cole, twelve exist today in private collections; in December 2005, one of these designs was auctioned for nearly £9000. Neither man had any idea of the impact it would have on Britain and later in America. Even the early Christmas card manufacturers believed Christmas cards to be a vogue that would soon pass. However, the Christmas card was destined to become an integral part of the season. By 1880 their manufacture was big business, creating previously unknown opportunities for artists, writers, printers and engravers. Early British cards rarely showed winter or religious themes, instead favouring flowers, fairies and other fanciful designs that reminded the recipient of the approach of spring. Humorous and sentimental images of children and animals were popular, as were increasingly elaborate shapes, decorations and materials. Cards continued to evolve throughout the 20th century with changing tastes and printing techniques. The World Wars brought cards with patriotic themes. Idiosyncratic "studio cards" with cartoon illustrations and sometimes risque humour caught on in the 1950's. Nostalgic, sentimental and religious images are once again popular, and reproductions of Victorian and Edwardian cards were easy to obtain. From the beginning, Christmas cards have been avidly collected. Queen Mary amassed a large collection that is now housed in The British Museum.